Happy April! Is that spring that I smell? My favorite produce season is back from bundles of asparagus to crunchy snap peas. I put together this seasonal menu that is so easy to put together, but breathtaking to look at. It won’t take a long time to have a taste of spring on your plate. Make my goat cheese peppery dressing so that you can always jazz up your favorite spring produce with something super flavorful to get things started. Pick up some fresh vegetables from a farmer’s market — asparagus, snap peas, and arugula are so in season right now! With those vegetables, assemble this raw salad. Make my easy za’atar chicken to complete a plate! If you guys make any of my recipes, feel free to tag me on Instagram (@edouardmassih) so that I can see that you are all as excited as I am about cooking in spring! What are you cooking this Labor Day weekend? Use my ultimate summer menu to spice up your table. From an appetizer to a dessert, I got it covered. Start off your party with my refreshing Cucumber Thyme Fizz and Olive Hummus to get the party started! Get the grill craking and charr up the corns to make this Charred Corn & Halloumi Salad. Get your sheet tray for the branzino! Papilote Branzino is the easiest way to cook fish without drying out. Mediterranean Orzo Salad complements Mediterranean branzino. 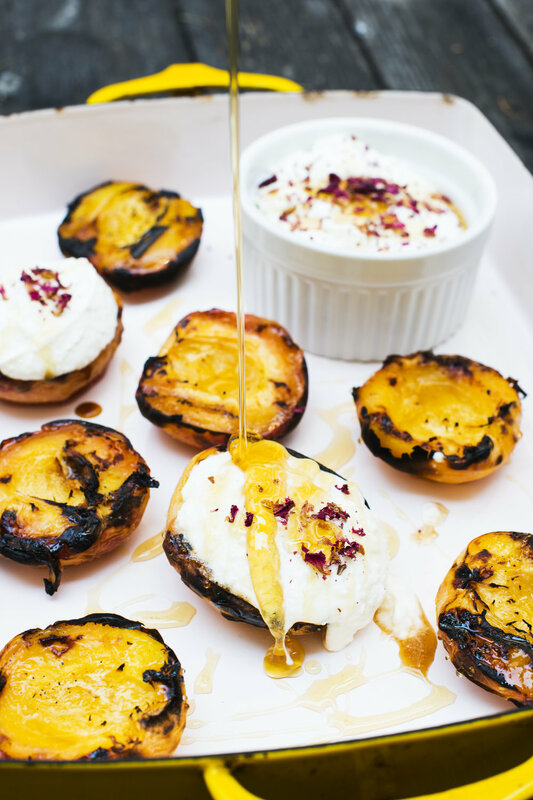 Finish your Mediterranean feast with my Rosewater Grilled Peaches. I am not much of a dessert person, so I decided to combine salty and sweet flavors. After grilling peaches, they get caramelized, and the sweetness from the caramelization goes so well with salty rosewater-infused ricotta. This recipe takes no time to assemble, and it's a healthy alternative dessert! Preheat your grill on high. Cut the peaches in half. Carefully remove the pits. Spray your grill with nonstick spray. Grill the peaches, face-side down first for 4 -5 minutes. Then, flip and grill for 2 additional minutes. In a small bowl, whisk ricotta, rosewater, and salt until well combined. Let peaches cool. 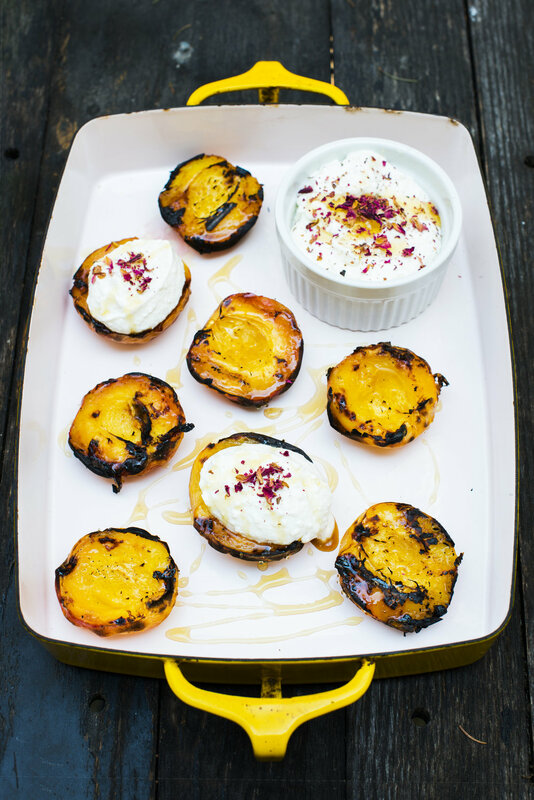 Scoop ricotta into the grilled peaches. Drizzle honey and garnish with dried rose petals.